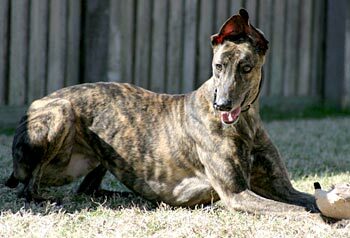 Keeley, aka HG Akeela, is a 2-year-old brindle female with adorable ears, born January 1, 2006. Her sire is BL's Hero and her dam is Dimple By Design, making her grandsire Gable Dodge. Keeley has 14 races beginning in Corpus Christi, Texas, on August 22, 2007 and ending in the same place on November 30, 2007. Although racing was not for her, she is certain that there is a home out there that is just waiting for her to move in. Results of Keeley's cat test: Keeley showed some interest in the cat until she got hissed at and swatted. Then her interest turned to less volatile things. Keeley should be cat trainable but as always use care and a muzzle when introducing her to new cats. Hopefully we can place her in a foster home where there is a cat (for more training). Small dog testing will come later. Keeley is one of the sweetest dogs I have ever had the pleasure of fostering. She has been a joy to have in our home because she is so easy going and so well behaved! She lives with three other greyhounds and four cats. At first, she had some interest in the cats and wanted to chase them when they started to run away, but she was easily distracted and therefore I knew she would be cat trainable. Now, after a week, I would consider her "cat tolerant" in our house. She does not pay any attention to the kitties now – even when they're running. She now has total run of the house. Keeley gets along well with the other dogs. She is very laid back and goes with the flow – you almost have to in order to live here! She loves to eat and she has filled out beautifully and her coat is very thick and shiny. 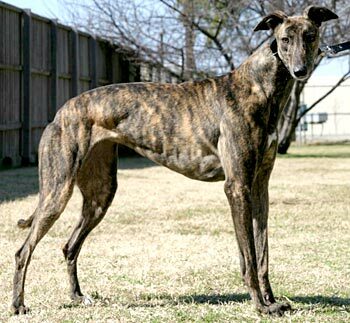 She is a BEAUTIFUL BRINDLE!!! She eats outside in a raised food bowl with all of her foster siblings. Keeley is totally potty trained and she has never had an accident in the house. She does stay in her crate for approximately 8 hours a day while her humans are at work and school. She also sleeps all night in a dog bed in the master bedroom in the cockroach position. The funniest thing about Keeley is that she loves Molly, our 7-year-old daughter. As I'm typing this, she is sneaking upstairs to lay with Molly in her room. She is extremely tolerant of her, as Molly likes to have dance parties with loud music and regularly dresses Keeley up. She also doesn't mind if we are petting her while she is on her bed or if we kiss and hug on her. Keeley also loves her playtime outside by herself. She knows about 7:00 in the evening it's time to play and she bumps the blinds on the door to signal us that it's time. She loves squeaky toys and will play fetch with us in the backyard.